Targeted Traffic from Referral Sites and Promotion. In this 9 minute video from our “Get More Business From Your Web Site” seminar you’ll learn what linking building (AKA Referral Site Development) is and how it can help increase your business by bringing targeted visitors to your web site who may do business with you and help improve your organic search rankings.
" We look at our web site as a sales rep who works 24x7 for us and never takes a vacation ." Getting publicity and mentions about your site on other web sites such as regional or industry directories, on industry news and association web sites, and other complementary web sites can bring a continuous stream of new visitors to your web site from within your target market. In addition, most major search engines perform a ‘Linking Analysis” to determine how relevant a web site is to the keywords being searched on (this is often referred to as Link Popularity or "Link Pop" for short). Basically they look for other related web sites that include links to your site (in addition to the links from page to page on your own site). So it's very important to have links to your web site in order to improve your results with search engines, both the traditional organic listings and the evolving Local Listings. However it’s not the quantity of the incoming links that affects rankings, but rather the quality as determined by each search engine. The majority of incoming links to a site will be “devalued” and have little or no effect on rankings. Incoming links can be devalued for many reasons including links from low quality web sites and directories, links from sites being penalized in some manner, links from paid listings on other web sites, links from affiliate partners, etc. We suggest only developing links and mentions (Citations) on "quality", industry, related sites, directories, etc., that can bring targeted traffic to your site – Traffic that may convert into inquires, leads, subscriptions, memberships, sales, etc. Consider the ranking boost you may get from these links an added bonus. Add content to the site to help develop a site that is more useful to your visitors and that others want to link to or mention naturally. We may suggest developing other digital assets such as video, etc to help dominate Page 1 results with listings from you site and other sites (See below for more on Blended Search results about this). We’ll develop a strategy to promote your web site within the online community such as participating in Social Media (such as profile sites, blogs & forums, review sites, press releases, etc). We look for e-newsletters that you can sponsor, opt-in email lists (these lists include people who have specifically agreed to receive certain kinds of email) that you can send messages to. Note: We do not participate in any reciprocal programs, link 'farms' and other link popularly schemes as there is a risk that your web site can be penalized by search engines if you participate in them. Links and mentions developed by participating in social media may help improve search engine results both both the traditional organic listings and the evolving Local Listings. eVision will not knowingly use any techniques widely considered to be SPAM by the search engines and directories. Many of these techniques can get your site penalized or even banned from a search engine. We adhere to the emerging "Best Practices" standards in search engine marketing. 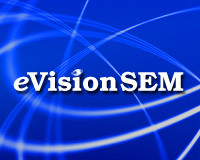 eVision is a member of SEMPO - The Search Engine Marketing Professionals Organization. Ready to have eVision improve your search engine results? Call us at 203.481.8005 or use our contact form. Why we'd like to stop calling it Linking Building? It leads many to the wrong behavior!